Freedom from the constant cost and hassle of needing new batteries. The charging station allows you to wirelessly charge two controllers at once, on contact. Automatic charging without the need to remove battery packs. Convenient LED indicator light will blink when control is being charged, and emit a steady glow when charging is complete. More power to play - each full charge provides up to 28 hours of play time. 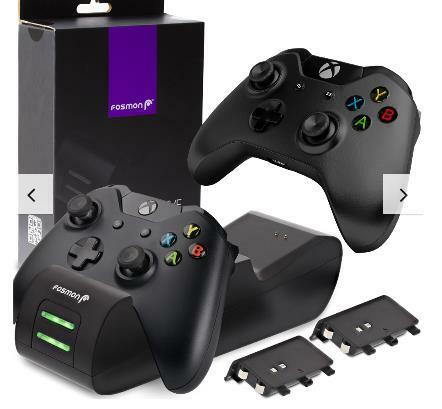 Compatible with most standard Xbox One, Xbox One S, and new Xbox One X controllers (please note the charge is not compatible with Xbox One Elite Controllers). Charging stations come with Fosmon's limited lifetime warranty. Please refer to Fosmon's website for more information. This charging station is now available at Amazon for $22.95 and is sure to help with those upcoming holiday XBox marathons.